"These crispy and unusual snacks are a real hit at parties. They are a nice alternative to the usual chips and pretzels. 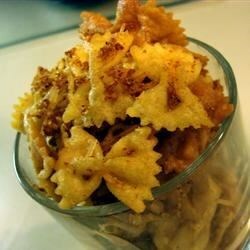 Use bow ties or your favorite pasta shapes when making this recipe." Bring a large pot of lightly salted water to a boil. Add pasta and cook for 8 to 10 minutes or until al dente; drain and rinse pasta under cold water. Pasta should be drained thoroughly of water. In a large skillet, heat oil to 375 degrees F (190 degrees C) and fry about 1 cup of pasta at a time until golden. Drain on paper towels. In large bowl, combine Parmesan, chili powder, garlic powder and dry mustard. Toss with drained pasta. Serve. Tasty little treats. Something different compared to potato chips. We sent some to our neighbors but got mixed reactions. The kids loved them though. These were just okay, seemed a little bizarre to me to have pasta as chips, especially with all that seasoning in there. Wasn't impressed with them at all. My family loved these,especially my children. I must have fried them for too long. they had a wierd chewy, tough consistency. They were hard to eat. If fried right they would still not be fabulous- not enough flavor.